Puppy-sized Goliath Spider Found in South America-Truth! - Truth or Fiction? Reports alleged that a “goliath spider” the size of a small dog was found in the rainforests of South America. Reports of a puppy-sized spider found in South America are true. Piotr Naskrecki, an entomologist and photographer at Harvard University, found and photographed the colossus spider called a Goliath birdeater. Naskrecki posted his finding on his blog, which quickly drew more than 120,000 hits a day. The Guinness World Book of Records says the Goliath birdeater is the largest known spider in the world, but they’re not the most deadly. Goliath birdeaters have two venomous fangs, but they’re not deadly to humans. Their primary defense is to rub their legs against their abdomen “sending out a cloud of hairs with microscopic barbs on them,” Naskrecki said. An while the Goliath birdeater is capable of eating birds, Naskrecki said it’s uncommon because they forage for their food on the rainforest floor. Forget the spider dog prank, this is an actual spider the size of a puppy! 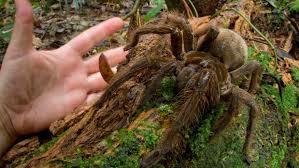 The South American Goliath birdeater may be the worst thing that exists: a spider so big you’d probably just want to hand it your wallet and run if you ever crossed paths with it. Sure, the notion of a spider crawling up under your skin is pretty freaky, but it turns out that spiders don’t really do that. What some spiders actually do, though, is grow to the size of dinner plates and run around hissing and biting things.